It’s baseball season, and my arm is already sore. I’m really excited about the 2 gigs this weekend. Friday night my pal Shad Blair is with me at the River Bar in the Grant Casino. That’s a 10 o’clock starter. It’s always a treat to play with Shad. He got me started in this stuff years ago. Then Saturday morning, yes I said morning, me and the fellas will be at South Main Iron at 11am. Did I mention when Shad and I get together we have a tendency to stay up extremely late. Or is it early. This is how the rest of March goes. So far this year, I played a show for about 70 men, it was different. I’ll probably never forget it. I’m glad the band was there to see all those guys looking back at us. I was also part of an amazing show at the Heritage Hall in Paris. 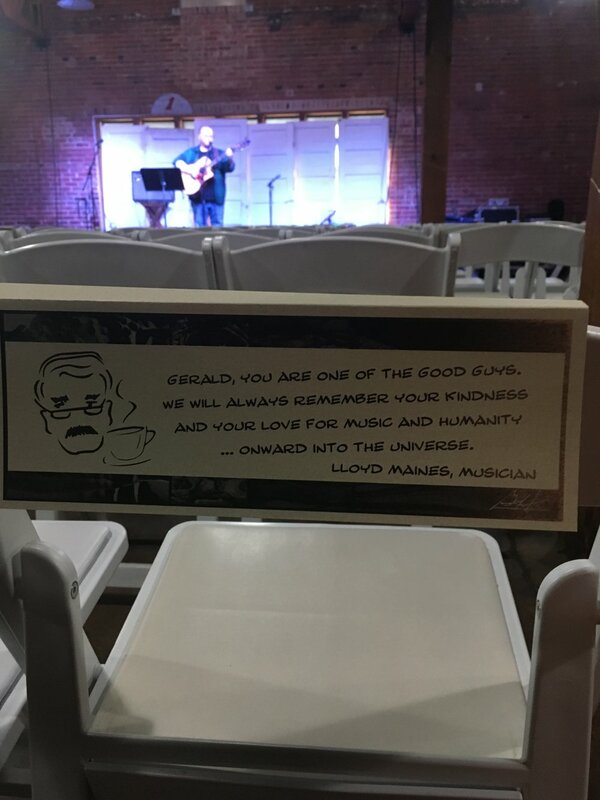 A tribute to the wonderful life of Gerald Hutchings, (That Guy’s Coffee). The show was full of great stories and memories and songs. It was so organized and perfect. We finished the night with the entire house singing (You’ve Got A Friend). I will never forget that either. January was full of basketball games, lots of days of work, a cold, a crick, back pain, new gigs booked, two books read, love and laughs. The new record "Stars" is off and running. It's for sale here on the website, plus digiatlly all over the land.. I'm very proud of this record. The cd release party was one of those nights I wont forget anytime soon. I wish we could do it again tonight. Lots of gigs coming up, come catch one if you can. Hey folks, it's been a while since my last blog. I told myself I was going to try and be more involved with talking about the going on's. I got a new record coming out in April, I'm really really really excited about it. Plus I got to jump on stage with Ray Wylie Hubbard last night. There's a couple of things worth blogging about. This coming weekend I'm heading down to Waller Texas to play the Chilli When It's Chilly event. This will be about my 5th or 6th time to play it, and it's always a blast. If you find yourself in the area, or if you want to get there, we'll be at the Jellystone Park in Waller. Songwriters everywhere, that means song circles. You want to hear about a cool spot to get away? Lake Caddo, in Uncertain Texas. Thats where I spent the last weekend with some great folks, playing songs and laughing and eating and a boat ride. I got Love and War in Plano this week, Wednesday night 8 oclock. Ol Shad Blair will there too.